Astrology, Sunsigns...either you believe in them or you don't. Or you can be like me..I do not think much about it but it is entertaining to read it sometimes. Especially when you are living in a hostel and some girl whips out a book and suddenly all you can hear is "Me first! Me first!" It just makes a dull evening so much more fun. Sun Signs by Linda Goodman. 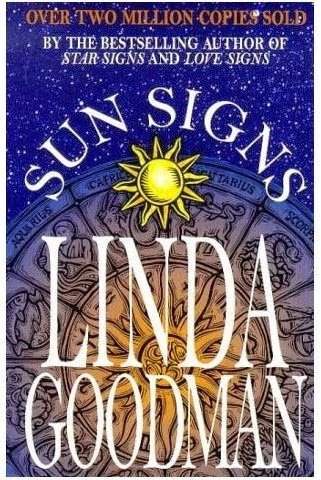 If you are even slightly interested in astrology then the author and the book name should not be unknown to you. Now, this is a book which you cannot read through and through (unless you are a total astrology freak). The book has chapters covering each sign in good detail (for example: if I take Cancer then- the sign in general, how to recognise one, the Cancer Man, cancer Woman, Cancer child, a Cancer Boss and the cancer employee. Neat, but that is a lot of detail). But it is so enjoyable to know about your sign and with family and friends about theirs. Reading about the characteristics and peculiarities of the signs will definitely fascinate you. This is one book that kept coming out again and again and roamed all around the hostel (people do want to know what their sign has to say when they see the book up). The traits and behaviour described about the signs are quite apt. You should not expect a 100% match but yes most of the details are accurate. I did laugh and nod a lot while reading my section. I do understand that some of you will be doubtful to try this book and there will be some who think that astrology is rubbish and predictions about the future is just some hopeless mumbo jumbo. So to clarify I should tell you that this book is not concerned with that aspect at all. It is something that deals with the individual personalities and the composition that people of different sun signs possess. It talks about the strong and weak points of each. So it is more like a guide about the signs. The language is very easy. You will not get boggled by those complex astrological diagrams and charts (so it is a good book for beginners too) and there is lots of positivity in there. Overall, it is definitely a good book for people who are interested by the mysterious world of astrology (for the others... maybe not so much. Although you could give it a try. It might fascinate you... one never knows).